‘Alice’s Adventures in Wonderland‘ intrigues me. After reading it dozens of times, I can’t seem to pin down the plot, or the events in the order that they occur. Reading it feels like dreaming. All I can remember is that it was entertaining, but strange. I think the power of the story lies in its resemblance to the process of growing up. It’s unnerving and non-linear. One moment you feel small and desperate to be heard by an adult world in which no-one takes you seriously, then the next minute you feel huge and unsteady in a body you’ve not yet grown into. You feel exposed and overwhelmed by it all. Maybe ‘Alice’s Adventures in Wonderland‘ particularly evokes awkwardness for me, as I once actually was a white rabbit in the headlights. I had to sing a solo and dance alone on the stage of the Ilford Playhouse in the annual school musical performance. I wasn’t pretty enough to be an Alice, but I had to stand in the wings belting out the high notes in Alice’s number, ‘Curiouser and Curiouser’, in case there was a flat or two on the night. 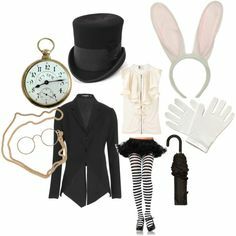 If that lesson in life not being fair was not enough, I can’t say that the white tights; semi-opaque white leotard which failed to hide my jumbo school pants; waistcoat and pocket-watch; and – biggest humiliation of all – a tightly fitted white fur fabric hat with giant ears that fastened under the chin, squeezing my fat freckly cheeks into pouches any hamster would be proud of, made me feel much better. They say time heals, but 35 years have passed, and I’m still feeling the burn! Fierce ‘White Rabbit’ Couture – Alas, unavailable in Ilford in the early 1980s. I now console myself that at least the White Rabbit has racked up far cooler cultural references than Alice has in subsequent years. Oh wait, did Neo discover The Matrix and his destiny by following Alice? No? 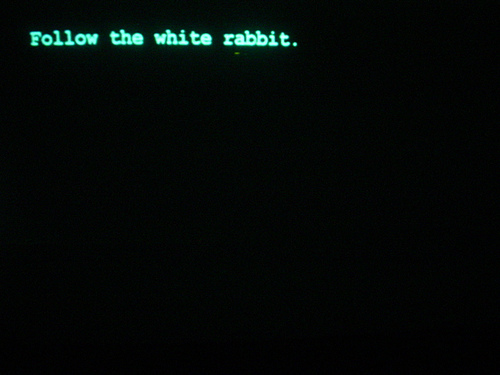 White Rabbit wins! >the process of growing up. It’s unnerving and non-linear. One moment you feel small and desperate to be heard by an adult world in which no-one takes you seriously, then the next minute you feel huge and unsteady in a body you’ve not yet grown into. You feel exposed and overwhelmed by it all. Are you mistaking this for Morrissey’s Autobiography?